Despite being depicted as a doggedly pitiless and unstoppable elemental force, capable of dragging even the most wide-eyed and innocent of souls screaming to their horrifying and unavoidable final ends, Death sure does seem to possess a wicked sense of humour in the Final Destination series. While Jason may stab, Jaws may devour and Leatherface may chainsaw, Death seems forever fixated on crafting an endless series of the most creatively Rube Goldberg-ian fatalities possible. I suppose that, being immortal and all, Death must have an infinite amount of time to sit around, surrounded by pencils, calculators and graph paper, to figure out how a routine trip to the carwash can lead, courtesy of a broken antenna, faulty moon-roof and shorted-out electrical box, to a shrieking young girl facing certain decapitation (or at least brutal, flesh-pulverizing scoring.). Boredom will do that to you, it would seem. Now, are these efforts somewhat pointless? Pretty much. A tad too cruel? Certainly. Kind of amusing? Well, yeah. 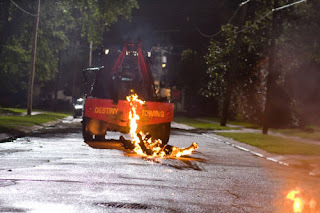 Unfortunately, though, Death’s cartoonish machinations are the only thing keeping the fourth film in the franchise, stupidly titled The Final Destination (Does the “The” mean that we have finally reached the definitive final destination? ), afloat amidst a sea of indifference and lethargy. Whereas the better series’ entries tapped into a certain interest ing, if superficial, universal fear regarding the nature of mortality, and man’s anxieties regarding the uncertainty of what lies beyond the Pearly Gates, this latest entry feels more like a contemptuous pre-packaged compilation of kills than an actual film. Blame it on a non-existent script, which even stoops so low as to utilize a lengthy Next-style dream sequence to pad out its 81-minute run-time (Including credits, kids!) and gore-factor, or the obvious boredom of returning director David R. Ellis – who helmed the superior second entry – but even the added 3-D gimmickry can’t make this Destination feel any less mundane or familiar. As we’ve already seen the splatter-tastic horrors associated with exploding airliners, fender mutilating traffic accidents and, um, broken-down roller-coasters (They were already running out of ideas with that one), The Final Destination in troduces us to the grisly joys of a NASCAR rally race gone awry. Crushings: Check. Impalements: Check. Beheadings: Check. Mopey but fresh-faced protagonist (Bobby Campo) preternaturally envisioning the gruesome event before it actually occurs and then dragging his friends, including a few cute girls (Shantel VanSantern, Haley Webb) and one douchey jock-type (Nick Zano – a poor man’s Travis Van Winkle), plus a few one-note bystanders (Mykelti Williamson, Krista Allen, Andrew Fiscella), away from the impending danger *breath* before all havoc breaks out, thus throwing Death’s fateful plan out of whack and dooming the survivors to even uglier alternative demises: Check. A fresh approach to this timeworn premise: Well, four outta five ain’t bad! Although sparkling characterizations and transcendent dialogue shouldn’t be expected, nor deemed necessary, to sell this type of material, it’s often confounding h ow badly The Final Destination falls on its face every time it calls on its actors to actually, you know, talk and express feelings and stuff. They sit around tables and living rooms spewing creaky exposition and having the exact same quarrels and freak-outs that the protagonists of the previous flicks had. You could literally erase the audio from the film and dub in dialogue from Final Destination 2 or 3 and it wouldn’t make a lick of a difference. Even more damaging is that this entry boasts the blandest cast yet, with star Campo blankly and droning on about premonitions, while the while the supporting players, appearing like deer caught amidst of blinding mass of headlights, weakly sob, squeal and vent. The only actor actually capable of delivering of any level of effective pathos, Mykelti Williamson, seems brought over from another film, staring gloomily out at t he world through wounded eyes and tearfully reminiscing over his painful past. He also must endure the film’s ugliest scene, where a redneck creep calls him the N-word and attempts to light a burning cross on his front lawn. Now, look guys, I’m all for edginess in my horror flicks, but this addition felt mean-spirited and cheap. Frankly, screenwriter Eric Bress should be ashamed of himself for tossing it in there when an ounce of subtlety would have sufficed (Yes, I recognize the irony in demanding subtlety from a film that features a man being sliced, Julien style, into squishy pieces by a chain-link fence. Humour me.). And where in the name of Sawa is series regular Tony Todd? You know you’re running a dubious production when even Todd, star of the impending Hatchet 2 and Murder for Dummies, won’t sign on the dotted line. Now, I’m sure that the past 700 words have mostly read like “blah blah decapitation blah blah cute girls blah” to you Final Destination fanatics (Do you guys have a catchy a cronym or moniker yet?) and you just want to know how cool the assorted collection of death scenes are. Well, there are a few corkers, such as a nasty variation on the ol’ pool-filter-sucking-out-your-insides urban myth, a squishy trip through an escalator belt along with a number of icky-drippy moments during the opening NASCAR car-tastrophe. But unlike the first two instalments, there’s no sense of tension or dread attached to the CG ghastliness, as it seems Death has read the script and, like us in the audience, knows exactly how the pecking order works and whose jig is up next. A little unpredictability would go a long way, especially since the Real Doll© cast dilutes any feeling of incre asing stakes. They, like the filmmakers, are just running through the motions in order to help the enterprise draw in some easy teen summer-movie-going cash. I should probably also add that this is the second film in as many weeks to feature an exploding movie theatre. However, while Tarantino, in Inglourious Basterds, fashioned a nightmarish inferno of cackling damnation, The Final Destination creates... an exploding movie theatre. Like everything else in the flick, it all just feels too little, and far, far too late. If this franchise is truly determined to continue (and I’m not crossing my fingers for it to do so), significant reinvention is going to be needed to keep drawing the required b loodthirsty packs of dedicated fans necessary to warrant further entries. As a horror film, The Final Destination is toothless, as a 3-D gore-a-thon it’s underwhelming and as a work of suspense it is just plain laughable. The Grim Reaper deserves better and maybe next time, God willing, instead of being forced to dutifully prop up another tired retread, it’d be better for all involved if Death just takes a damn holiday. P.S. The Final Destination has the worst recreation of a movie-going audience in the history of cinema. It's akin to the Friends episode where the gang goes to the Hootie And The Blowfish concert. Have any of the people behind these productions ever attended a large-scale entertainment event with the paying public?